There’s no doubt about it, we North American birders have it easy. Our warblers are impossibly colored. Our chat is big and weird. Our Herring Gull is only one species. There’s a reason that many of the continent’s best field birders are all European ex-pats who were trained in the ways of Phylloscopus and Acrocephalus and who forsake all that to join the land of Setophaga and Geothlypis. But the one group of birds that we North Americans can legitimately claim to puzzle over are the tyrant flycatchers, particularly the difficult genus Empidonax. There’s scarcely a birder among us who feels confident about them all the time, and while many Empids do the right thing and vocalize in unique ways (well, mostly unique), way way too many of them are relegated to the dreaded Empidonax sp box. Even the best must draw the line somewhere sometimes. So in order to tackle the Empid problem, birders have devised mnemonics, intended to make identification simple on the chance that those wretched little birds deign to bestow a vocalization on us. Birders know them well. Che-beck. Pizza. Fee-bee-o. Fitzbew. Here’s the thing though. They’re terrible. Really really awful ways to remember this vocalizations. And I think that every spring when the first Acadian Flycatcher says something that could not sound less like “Pizza”. These things are awful. There needs to be better way. Acadian Flycatcher at Eno River State Park, Orange Co, NC. Not saying Pizza. 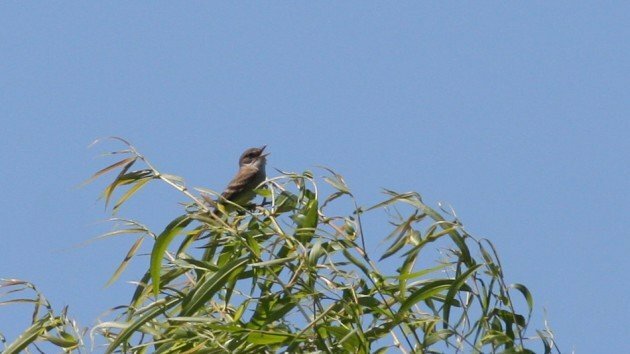 Case in point, a couple days ago I chased a Willow Flycatcher in my home county. It was singing in, where else, a willow swamp. Willow Flycatcher is an uncommon migrant in my part of the state. Annual, but not often found. It was, in short, a pretty good bird and I was going to make an effort to see it. So I rolled up to the swamp and listened for the tell-tale Fitz-bew. Only I didn’t hear it. I heard something else. Something more like a b-b-b-bRITZ-hew! This is where a Willow Flycatcher lives. Now you may think that the difference is pretty minor, that I’m being some sort of birdsong pedant by even bringing this up. But birders are told from the time they’re novices that Willow Flycatchers say Fitz-bew and Alders say Fee-bee-o when they say nothing of the sort. And the problem is that birders will be listening for the wrong thing, or they won’t be able to recognize what they’re hearing when they hear it. I’m not sure how these mnemonics became such common knowledge (maybe RTP? ), but they’re not doing birders any favors. A big part of the problem is the use of the letter F in these mnemonics. In humans, the sound of the letter F is made by placing your lower lip against the bottom of your top teeth and blowing. You can see why this is a problem for birds, who lack both lips and teeth. Yes, there’s no commonly accepted language for talking about incredibly variable bird vocalizations, but can we at least agree to leave F out of them? Particularly when that particular letter fails to describe the sputtery percussiveness of a Willow Flycatcher song? Bird books are rampant with this stuff. Acadian Flycatchers say Pizza, but they really saw “peet-SA!”, because no one stresses the second syllable in that word even with the most outrageous Italian accent. Yet beginning birders are fed this stuff as if it’s birding lore. It’s time to break free! I’m not sure what the answer is other than to come up with, as a community, more clever sayings. We deserve a better brand of bird songs. Let’s here what you have to say in the comments! Great points! I agree most the pneumonics don’t translate well but I think they serve as sort of a reminder or create an association that aids mental retention in one’s brain which then begins to tune out the actual song heard and replace it with the associated pneumonic for the bird. In other words our brains adjust what we hear to fit the pneumnonic we are taught which becomes second nature over time and years. Sometimes this process is fairly successful and sometimes not. Pneumonics that work for me include: “Zee zee zeeo zoo zay”for BTGW and ‘Quck three beers” for Olive Sided Flycatcher and “Pizza’ for ALFL despite the inverted accent. On the other hand “fitz bew” “fee bee o” for Willow and Alder Flycatcher respectively don’t work for me and I pay more attention to quality of the sound to separate those two. I find that listening to quality of sound and doing very rough sketches of the song on paper showing the number of notes and their relative pitch can be useful . No need for perfect pitch just draw each line for each note and if one is higher in pitch just place it higher on the page… etc.. This was not my idea but something I read somewhere along the line by Pete Dunne or perhaps Sibley or Kaufman… can’t recall whom ..I guess I need a mneumonic for more than just bird songs. I don’t find word-based mnemonics all that useful for most vocalizations since the rhythm of the words is often not aligned with the rhythm of the song. So I mostly prefer phonetic mnemonics. 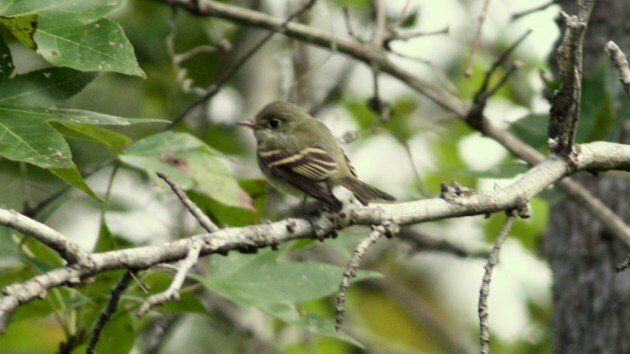 Acadian Flycatcher sounds to me like “wee-SEET!” I’m not sure what to do with Willow and Alder, though. Your statement that birds can produce and “F” is very interesting. I never thought about that and will test it in the field here in Germany. Having said that, you Americans “complain on a high level” as we say in German. Do you have any idea how difficult it is to describe the oh so vital calls of Phylloscopus warblers? Or the sounds of Acrocephalus and Hippolais/Iduna warblers? Jochem, as an American birder new to European warblers in Germany, I feel your pain. Yeh, I struggle with these pneumonics as well. Seems to me WLFL and ALFL can both, in some manner be fit to “three beers”, so the pneumonic is basically useless. Instead, I think they can be differentiated based on relative inflections….at least, I haven’t come up with anything better. I do know that the first time I hear an Empid every spring, I start muttering, “Pizza? Free beer? Fitz Bew!” Which does nothing to improve the image of birders as sane people when this happens in public. I, like Corey, hear the Alder Flycatcher song as two syllables (I also use “Free beer”). I started using The Warbler Guide this spring to re-learn and learn a few new warbler songs and they don’t use mnemonics. They talk about quality, pitch, speed, the differences between clear, buzzy, complex, and trilled notes, whether notes are staccato, slurred, drawn out…I’ve quickly learned the songs and held them in my memory far easier than I ever did with mnemonics. I keep wondering if this would work for other species groups. Of course, there is a bit of a learning curve, but I’ve found it worth it. The common verbal mnemonics for bird calls almost never sound right to me, with the exception of the phoebe shouting out its name (is that also an exception to birds having no letter F sound?). I agree with The Warbler Guide approach–it’s better to hear a bird call or song for what it is instead of trying to twist it into something that it isn’t. I went out and promptly heard both Willow and Alder after reading this post. I tried figuring out a better start to the mnemonic than an ‘f’, but failed. I think starting with the ‘f’ for ‘fitz-bew’ gives that first syllable the right pitch and speed to match the actual call, even if its not the exact sound they make. ‘zzzrrrrit-bzzzew’ might be my attempt at what Willow Flycatchers say but its barely pronounceable. I think “It’s you” almost works, but the “f” also makes you want to accent that syllable like the bird does. I think of Willow as a ‘wolf’ whistle – the one made by someone on the street wanting to attract the attention of a girl they think is pretty. Both start with the letter ‘w’. Alder is a kind of ‘hey, come over here’ whistle. Lol. To me the word pnemonics don’t indicate relative pitch of the notes so I am trying out assigning words such that the first consonant of each syllable indicates relative pitch. So a syllable starting with ‘w’ is a higher pitch than one starting with ‘p’ for example. But then, there is still the challenge of rhythm. Fun, fun, fun!